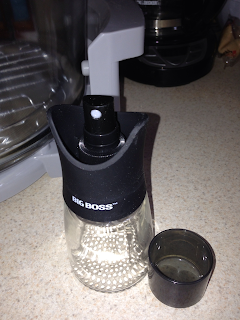 The Big Boss Oil-Less Fryer is a healthy way to cook. And with my busy schedule, it is quick and easy. 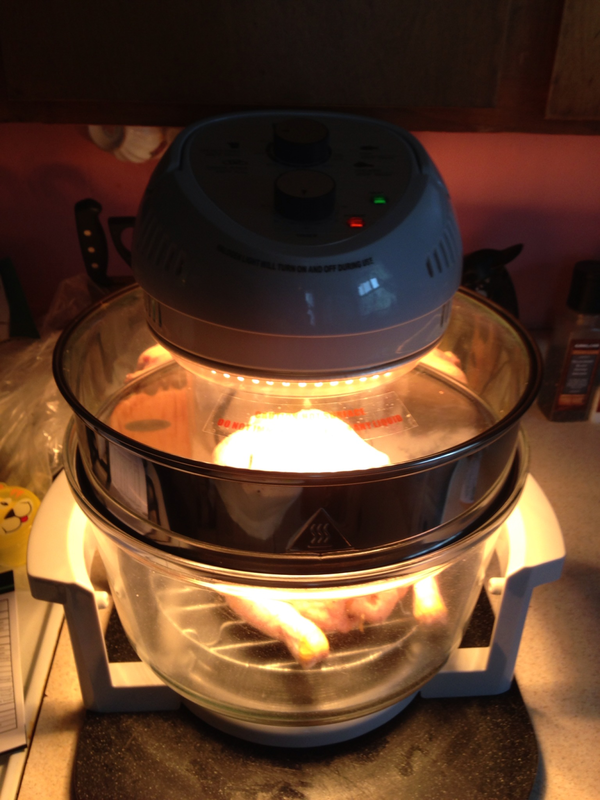 This tabletop cooker combines halogen heat, convection and infrared technology that leaves foods crispy and brown and moist on the inside. You don’t need to add any fats or oils. You don’t even have to thaw the food to cook it! And it uses less energy because it cooks up to 3 times faster and doesn’t heat up your kitchen. It includes an extender ring and cooking racks so that you can cook more than one food at a time. How neat is that? I unpacked the carton and set the cooker on my counter. They even included a sprayer to spray the food and the racks. Wow!!! I have to say that the Big Boss is one of my favorite things I have ever reviewed. 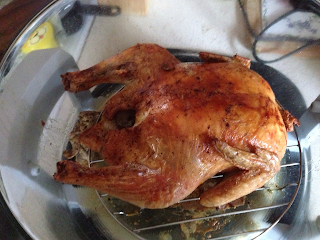 As most people do, I tried cooking a whole chicken. It couldn’t have been easier. I read the directions for cooking my whole chicken. It told me to place the chicken breast down on the rack. 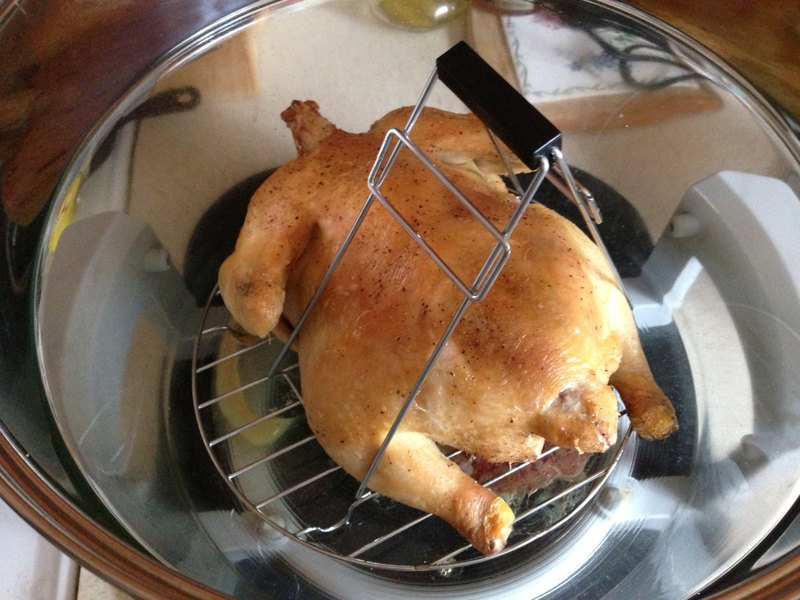 I had read some other reviews and realized that food sticks on the rack so I sprayed it well before I put in the chicken. 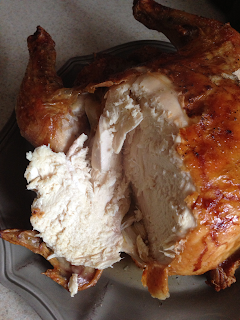 I also use the spray to spray the skin on the chicken because I do that when I cook mine in my regular oven to make it brown. I just seasoned my chicken with salt and pepper as usual. After making my first one, I see the possibilities of making all the deli flavors I have seen. As you can see in the picture, half way through you need to turn the chicken. The tongs included helped me do that with ease. They were the perfect size. And it didn’t stick at all. I finished cooking with the breast side up. The top has a handle that only works when the handle is down. The handle built into the top makes it so much easier to access the food. You just lift it off and set it to the side and it isn’t even hot! The chicken sits on the rack letting the fat cook off and go to the bottom. The glass dome that it cooks in is actually a glass bowl, so when the chicken is removed, you can pour out the yummy juices to make a gravy or sauce. And the chicken is crisp and juicy at the same time. I loved it. Forty minutes from start to finish was perfect. The ease of the product, the results, and the taste make this one of my favorite kitchen items to date. I will never buy a deli chicken again. I received a product to review. All the photos and opinions are my own. Like the concept however, I can not find anyone on web who cooked in layers and liked it. Have you cooked various items besides french fries and onion rings and chicken. That’s about all people comment on. I need various foods cooked at the same time to save time. Any ideas? 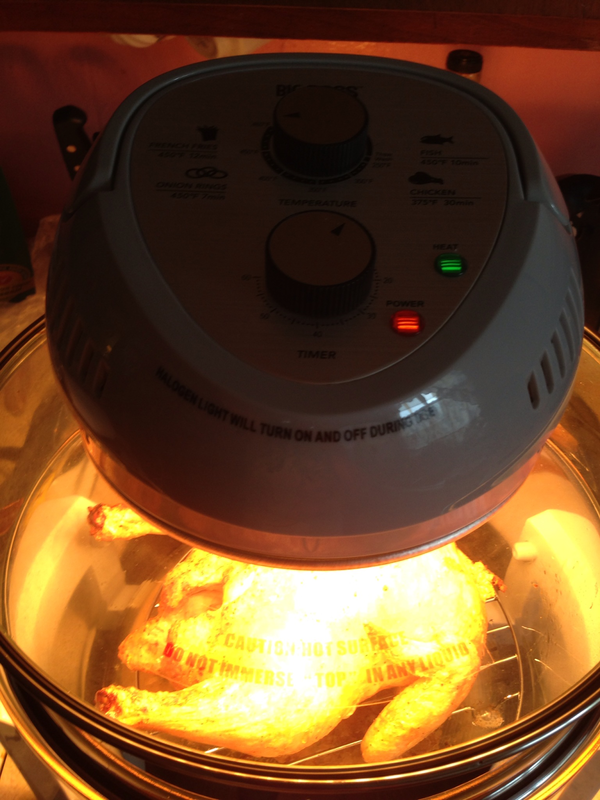 Really liked what you had to say in your post, Big Boss Oil-Less Cooker | Life with Norma Kay, thanks for the good read!